The biggest obstacle to getting rid of cane toads is that a single clutch can contain more than 30,000 eggs. This means that even if you catch and kill 99% of the adult toads in an area, the few that are left can produce so many offspring, that before you know it you are back to where you started – just as many cane toads as ever. The only way around this problem is to stop the toads from reproducing. If we can do this, then removing adult toads can make a big difference because there are no new toads being born, to replace the ones we are eliminating. But how can we stop the toads from reproducing? Recent research by Team Bufo has found an exciting new weapon that can make a huge difference … we have discovered a chemical that is highly attractive to toad tadpoles but repels the tadpoles of native frogs. This makes it perfect to use as “bait” in a funnel-trap to catch toad tadpoles. Other native fauna that live in ponds (like fishes and insects) aren’t attracted to this chemical, but toad tadpoles are incredibly good at detecting it, and they search for its source as soon as they encounter it. When we use this chemical as bait in a funnel-trap, we catch thousands of toad tadpoles and almost nothing else. In one natural pond, we collected more than 40,000 toad tadpoles in less than a week. 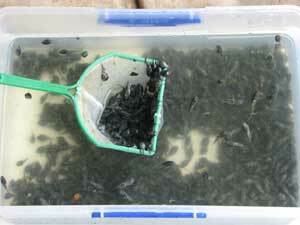 Cane toad tadpoles cluster around a trap in the field. Even better, the chemical is cheap and easy to obtain in any area where cane toads are common – it occurs in the toad’s own poisons. So we simply squeeze the shoulder (parotoid) glands of dead toads (after they’ve thawed out from their time in the freezer), and use that secretion as the bait. 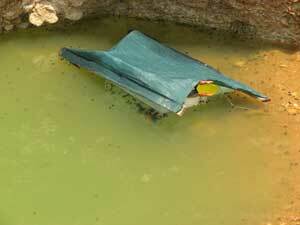 Traps baited with toad poison caught tens of thousands of toad tadpoles within a few days! Unfortunately, we don't recommend the method to members of the general public because the toad’s poison is very dangerous to humans as well as many native species (and pet dogs,etc.) so collecting it must be done very carefully. The collection should be done by someone who has been trained in the right methods; and suitable protective equipment (gloves, safety glasses, no exposed skin, etc) is absolutely essential. We hope to train people from local “toad-busting” community groups in the proper methods. Until then, a dead toad inside a funnel trap can serve as a “bait” for toad tadpoles, without requiring any risky squeezing of poison glands. However, it's less effective than using the poison - and unless the trap is checked regularly and the "bait" replaced, the dead toad will attract scavenging native animals (especially insects, like water beetles). We hope that we will soon be able to produce a safer easier-to-use "bait" (a purified chemical), because the basic method is simple and is well-suited to use by community groups. It doesn't need any complicated equipment. Any kind of funnel trap (or minnow trap, as the Americans call them) works fine, so long as it is made of plastic, or of mesh too small to allow tadpoles to escape. The simplest type is made by cutting a large plastic soft-drink bottle around the middle, and attaching the pointed end so that is points back towards the base to form a funnel. Several youtube videos show how to make minnow traps like this. Add an attractant (even just a dead toad) as bait inside the trap, and you have an effective toad-tadpole trap. In continuing work with our collaborators at the University of Queensland (Professor Rob Capon and his group), we are developing an even stronger, safer, and easier-to-use bait. To do this, we will isolate the active agent in the toads’ secretion, and use it in pure form without all of the associated poisons. Once we have the bait in tablet for, it should be easy to hand this new weapon to community groups and members of the general public who want to stop toads breeding in their local ponds. We have taken out a patent on the technology, and are working with a commercial company to produce a tadpole-control system. We have passed on instructions about our new method to some community "toad-busting" groups in Western Australia, Queensland and the Northern Territory. They have reported excellent results. Graeme Swayer, of Frogwatch NT, tells us that his group has now removed over 200,000 toad tadpoles from natural waterbodies using our method. In total, community groups have now caught over a million toad tadpoles. It's a great example of scientists and the community working together: how scientists can develop new approaches, that can then be implemented by members of the general public who are concerned about the environment. And in even more recent news, our discovery of a "suppression pheromone" - a chemical produced by older toad tadpoles, that kills younger ones - looks set to be even more powerful. We talk about this new discovery on some of our other pages on this website.